It is important that when contacting a Elkhound breeder that you express health concern issues and ask the breeder what they are doing in order to help mimimize them. Please don't purchase your Elkhound from a petstore which commonly are known to support Elkhound puppy mills. Doing so only promotes inproper breeding ethics and promotes current Elkhound health issues. 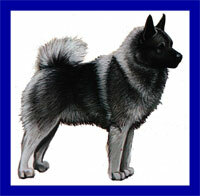 The AKC, UKC, FCI, CKC, SKC, WWKC, FIC registries recognize the Elkhound breed standard. Country of Origin: Norway - Skeletons dating back to the stone age are nearly identical to today's dog. Used for both herding and sledding dogs. National Dog of Norway. Known there since the Viking era (800-1000 AD). Versatile, having been used in a variety of areas such as hunting ber and moose and small game, mountain rescue dogs, pulling dog sleds, tending and guarding flocks and homes. Thought to have Spitz forebearers. Character: This dog is straightforward, intelligent and cunning. Temperment: This dog gets along well with children, and any household pets. It gets along well with other dogs, although they may be frightened by its bark. Although not good watchdogs, they are reserved with strangers. Coat: Thick undercoat with thick, dense covering hair. The outercoat is grey. There are usually cream patches on the nose, throat, legs, chest and tail. Care During shedding a coarse comb should be used to remove loose hairs. Comments: Because of long association with humans, they make fine companions and house dogs, and are especially good with children. Adaptable to all climates despite traditional thought they are only cold climate dogs. Hunters. Medium build, independent. .